Click here for the complete labor and delivery story. 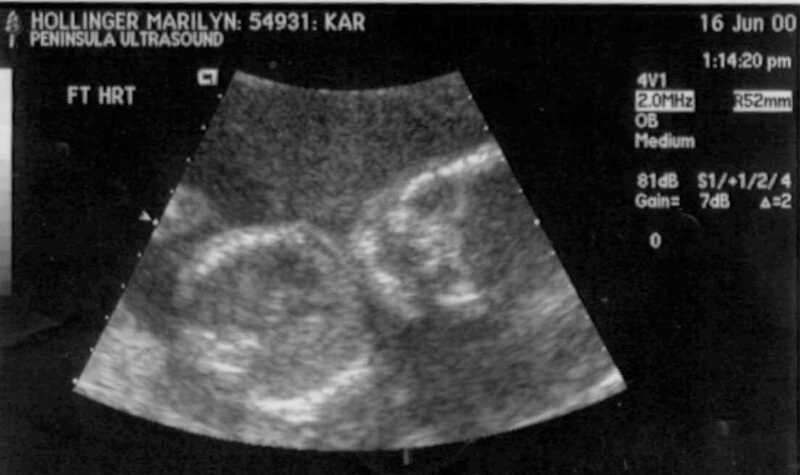 We decided to try to have a sibling for Katelyn just after her first birthday, December of 1997. We figured it would take a few months, and that would make the kids about 2 years apart. We'd bought up all the remaining vials of sperm from the same donor as Katelyn so the kids would be full-blood siblings. We began the process in the same was as we'd done it before, which was tracking temperature and ovulation, and doing 2 intrauterine inseminations (IUI) each month. We did this for over a year before realizing something was wrong. A closer examination revealed a short luteal phase. This means the length of time after ovulation, before the next cycle, was too short, not allowing a potential baby to implant in the uterus before the next menstrual cycle started. We started seeing an ob/gyn with a specialization in fertility. We tried the fertility drug Clomid, being monitored by ultrasound to track the development of growing follicles on the uterus. The other problem we found was something called insufficient ovulations. A mature egg follicle (the sac containing the microscopic eggs) is about 20mm in diameter. Mine were about 14mm in diameter at ovulation, so they weren't mature. The Clomid didn't help. 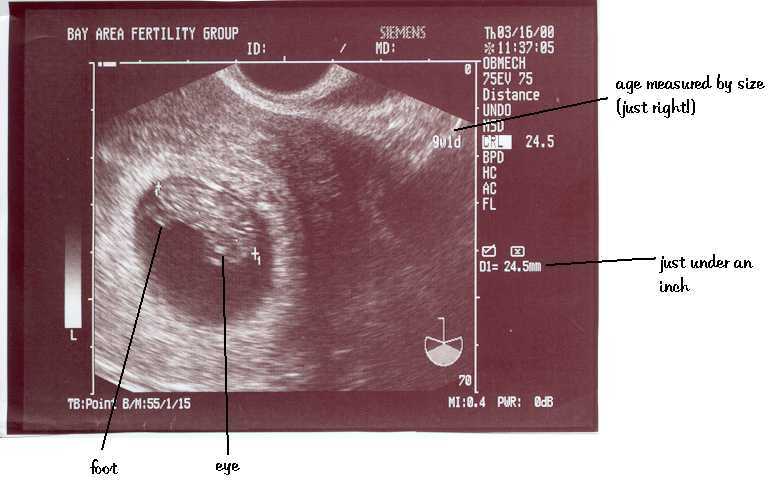 In November of 1998 we decided to try injectible infertility drugs. This meant switching to being treated by a Reproductive Endochrinologist, which is an ob/gyn with a specialization in the hormones related to infertility, reproduction, and menopause. Starting in December we did 3 cycles using a drug called Fertinex, injected once a day, to stimulate follicle growth, and Crinone (progesterone) vaginal applications once a day. Each time we had 2-3 mature follicles and then did an IUI. No pregnancy. Actually the last time we had what's called a chemical pregnancy, which means we got pregnant but miscarried before the pregnancy could actually be fully confirmed. This took us through the summer of 1999, with a month off between each cycle. At this point we were starting to run out of donor sperm, and we starting to think that it was never going to happen. On our doctor's advise was to move to IVF, In Vitro Fertilization. The IVF cycle is quite complex. We were not successful on our first try, but were on our second! Here's what the schedule looked like for that cycle. See the calendar below for a visual view, coded by color. 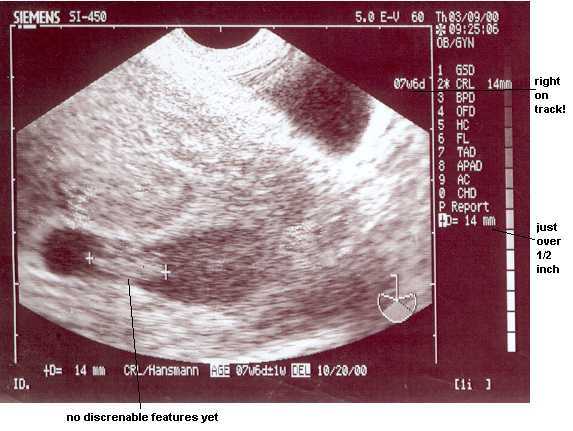 *** 1/6/00: Pre-lupon ultrasound: determines that there is no activity in the ovaries. *** 1/7/00: Start Lupron. This suppresses ovulation, as we are about to massively stimulate the ovaries and the body's natural response is to ovulate. This drug produces menapause-like side effects.This is injected daily using a insulin needle in the abdomen. *** 1/9/00: Stop birth control pills. This produces an artificial menstrual cycle start. 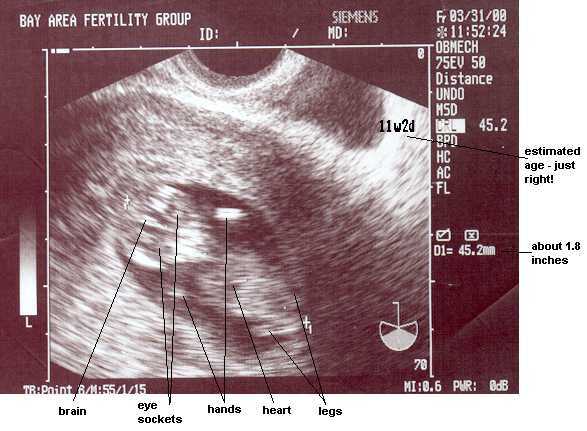 *** 1/14/00: Pre-stimulation ultrasound. This makes sure everything is stable - nothing growing. *** 1/15/00: Start stimulation drug, Follistim. This is a type of FSH, Follicle Stimulating Hormone. Start with 5 vials. This means using a needle to pull in sterile water, then pushing that into a powdered vial, then pulling that in, and pushing it into the next vial, and so on, then injecting using a small needle into the abdomen. Started with 5 vials. Also, reduce Lupron by half. Start taking baby aspirin, to increase blood flow and encourage good growth of the uterine lining. *** 1/18/00: Reduce to 4 vials of follistim. 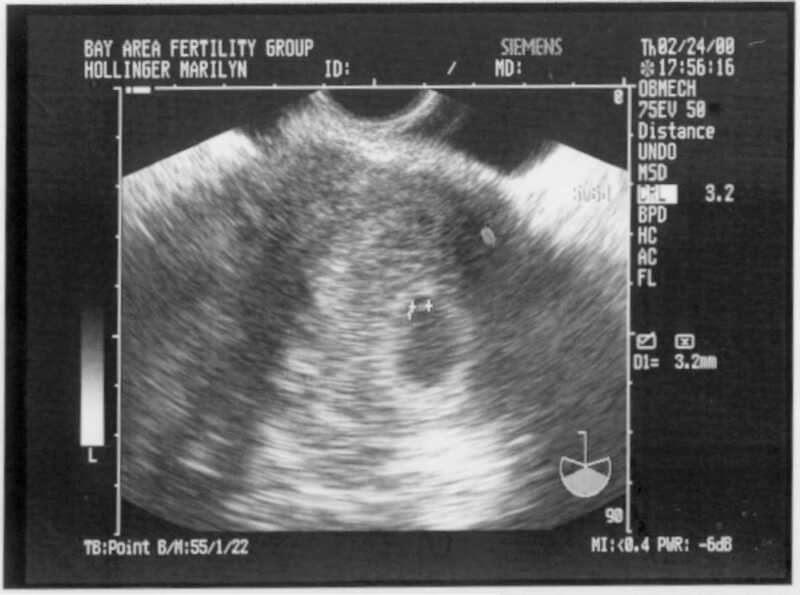 *** 1/23/00: Ultrasound: follicles are almost ready! *** 8:15pm 1/24/00: Profasi (HCG) injection. This starts the ovulation process, preparing the follicles for retrieval exactly 36 hours later. *** 8:15 am 1/26/00: Egg retrieval. This is done under a general anesthetic. It involves inserting a hollow catheter through the cervix into the uterus and pushing a needle through the catheter adn through the wall of the uterus into each mature follicle, using an ultrasound to guide it. The goal is to retrieve 10-20 eggs. The first IVF cycle we retrieved 13 eggs, but the second time only 3 eggs. Immediately after the retrieval the sperm is introduced to each egg. In our case we did ICSI (Intracytoplasmic Sperm Injection) which is a micromanipulation procedure where a single sperm is injected into the egg to enable fertilization. Start Crinone (progesterone) vaginal applications twice a day. *** 1/29/00: Transfer. 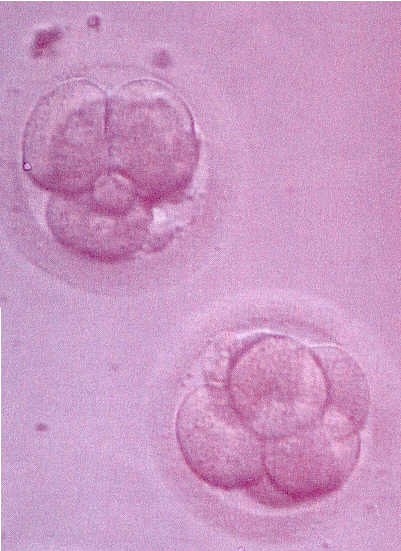 The embryos are "graded" depending on various factors. The best 2-4 are re-introduced into the uterus through a catheter. In our case only two grew, but they were grade A. Click here for a picture. Now the wait begins until time for a pregnancy test. *** 2/11/00: Pregnancy test: POSITIVE!! As you can see, going through one of these pretty much takes over your life! In addition, we were working through the Reproductive Science Center in San Ramon, about 40 miles from our home through one of the worst commutes in the world, so the trip there was quite long. 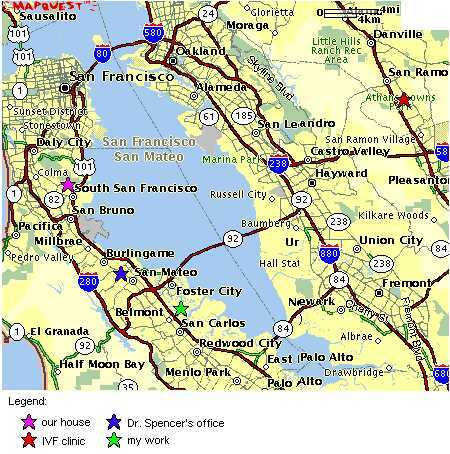 Luckily we were able to do much of the monitoring (ultrasounds) at the office of Dr. Susan Spencer in San Mateo. So we only went to San Ramon for one of the ultrasounds and the actual retrieval and transfer. Since getting pregnant we've also been there 3 times for ultrasounds, and have one more scheduled. And remember that this was our second IVF cycle, so this was the second time we did it. Needless to say, we're exhausted with the effort...and THRILLED with the result.